In the late 1960s we visited the slate quarries of Tilberthwaite in the Lake District, usually on wet days when we had been rained off climbing on the ‘better’ crags. Later we set up long abseils in the Cathedral quarry to impress the PE students we took there as part of their outdoor activities course. But it wasn’t the activity that was remembered, it was the incredible grandeur of the rock architecture, the wonderful effects of light and shade created within these deep pits and the quiet and stillness where once there had been the noise, constant movement, and the general mayhem of the hard and dangerous job of quarrying slate. 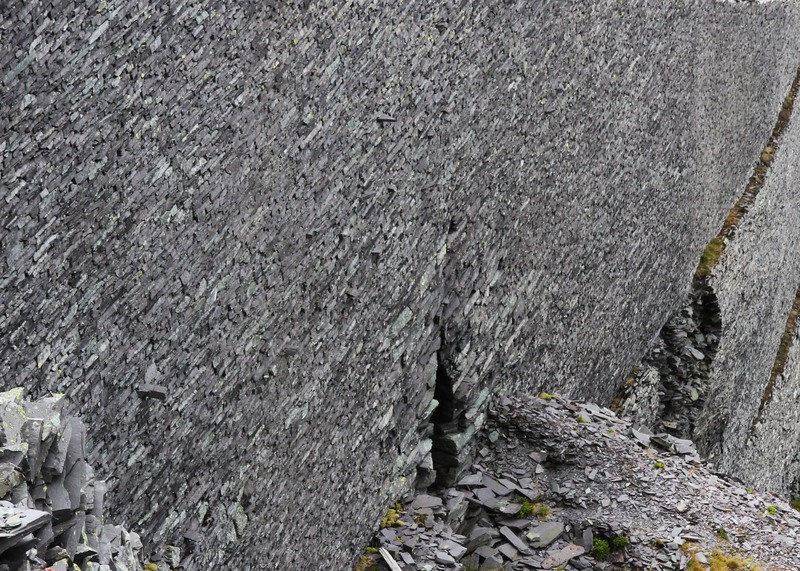 Driving through Llanberis you could not fail to notice the monstrous heaps of slate waste and vast rock faces of the Dinorwig quarries across the lake. The whole side of the mountain, and a good part of the inside, had been chopped, sliced, split and generally smashed into pieces. 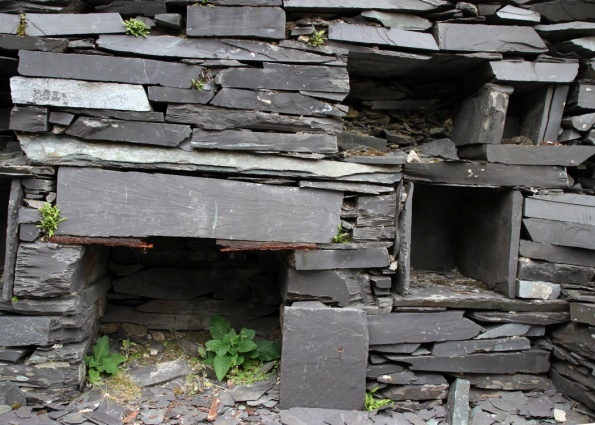 Much of it was thrown away, creating the huge heaps and screes of spoil, whilst the good bits were carted off for roofs, walls and garden rockeries, until it all came to a grinding halt as the price of slate made it all financially unviable. The scale of the workings is huge, some of the rock faces being 75 metres high. The structures built within the quarries can also be huge, the supporting walls for the inclined planes being particularly impressive. So immense is the whole undertaking that it is difficult to believe that men made this with basic tools, no safety gear and the minimum of mechanised equipment. Yet all around are the reminders of these men, the old boots, rusting shovels and graffiti still seen inside some of the remaining buildings. It was not surprising that rock climbers had eyed up the steep, clean rock faces for new route possibilities and moved in very quickly as soon the quarrymen had moved out – the first two routes recorded in the most recent guidebook are 1964 and 1969 (the year the main quarries closed). 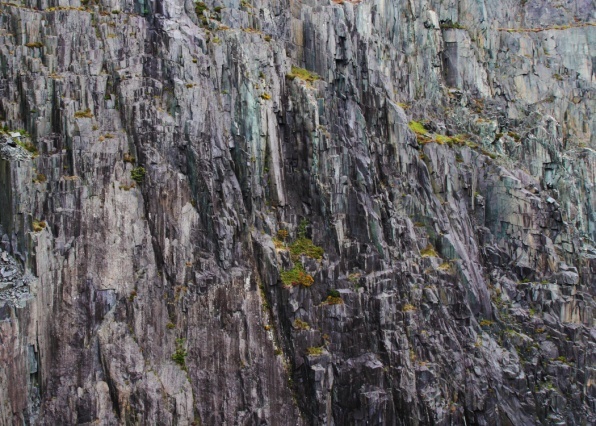 Although the first climbers tended to be English, often ex-Bangor students, usually unemployed, just living simply and climbing very hard routes mainly in LLanberis, it is the great Joe Brown who was attracted – and impressed – by the huge, clean walls of steep grey rock. His first route, called Opening Gambit being done in 1971. Abandoned quarries, mines, farms and even whole settlements are found across every wild area usually left to decay many, many years ago but occasional surprisingly recently left by the owners or tenants. Sometimes there are poignant reminders of those who lived and worked there – old bedsteads, fireplaces and pots and pans – but mostly just the stones of the walls and few decaying timbers gradually fading back into the earth. It is this that I find I am attracted to time and again, seeing the remains of a life now gone slowly being the reclaimed by the surroundings in which it once flourished or struggled within. The building stones carved from the land locally once more becoming a part of the landscape. 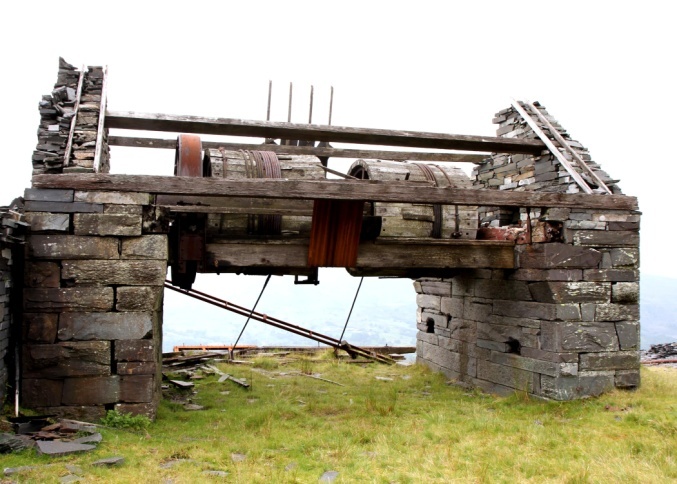 Scattered around are a few buildings and winding drums from the inclined planes that once dragged the slate blocks around the site. Here and there are the spitting sheds where the pure roof slates were cut and trimmed to size. 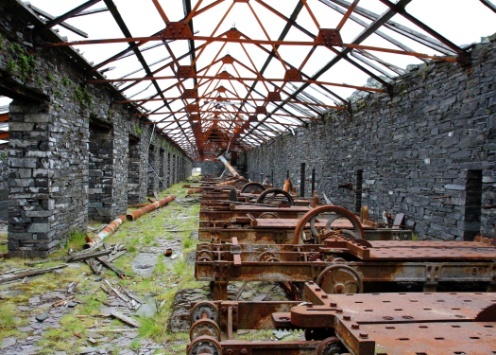 But up high in the quarries the cutting benches still sit which once cut up the large slate blocks, silent now where once their screaming, deafening circular saws once filled the air all around and the unprotected ears of the men who worked them. Nearby the huge machines that provided the power for the saws are rusting and quiet, birds’ nests built nearby and ferns growing all around with the manufacturers proud name plates still prominent, read only by those who make the journey through the spoil heaps, passed the gigantic rock faces and up the inclined planes to get here. The Dinorwig quarries have attracted me in the same way for many years and I have photographed them from afar many times. Recently, with help from a very knowledgeable and successful climber, I made a journey deep into the quarries to see close up the rock faces, the spoil heaps, old buildings and general jumble of an abandoned industrial lathe huge chunks of machinery and landscape albeit one set within a area of outstanding natural beauty. The day was overcast, a typical leaden Snowdonian sky, lessening the deep shadows that would otherwise have made photography difficult. Late in the day the sun came out to light up the details of the place as I made my way out once more. I love the colours of the rock, the greys, blues and purples streaked with orange, red and green. One area is called the Rainbow Slab and it is clear why this should be. It is a place of awesome beauty, great ugliness, adventure and fear in equal measures but not one that can be ignored. Visiting is easy either from Llanberis itself or nearby Denoilian and follow the various paths. 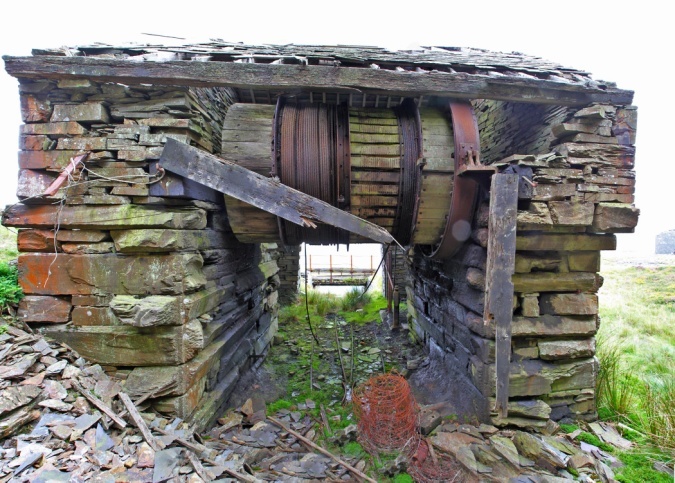 Getting close to the rack faces and higher up into the quarries requires you to climb over fences – notices advise your visit is entirely at your own risk – to scramble across loose slate heaps and possibly up and down rusting ladders. It is not a place to be taken lightly but it is rewarding on many levels. Many birds have taken advantage of this place, no doubt many mammals have too, plants that specialise in reclaiming such sites and flourishing and more will no doubt move in as the soils build up once again over the loose rock. A recently published guide to the climbs in the quarries will probably increase the climbing activity in the next few years and without doubt one keen photographer will be returning again and again to try to capture the unique nature and undoubted beauty of this landscape. As a potter, artist and photographer, Chris Hughes’s work reflects his own interest in the landscape, birdwatching, mountain walking and climbing. He has exhibited work in exhibitions all over the NW of England with the Art and Craft Guild of Lancashire and now at their Gallery at the Wharf in Burscough. 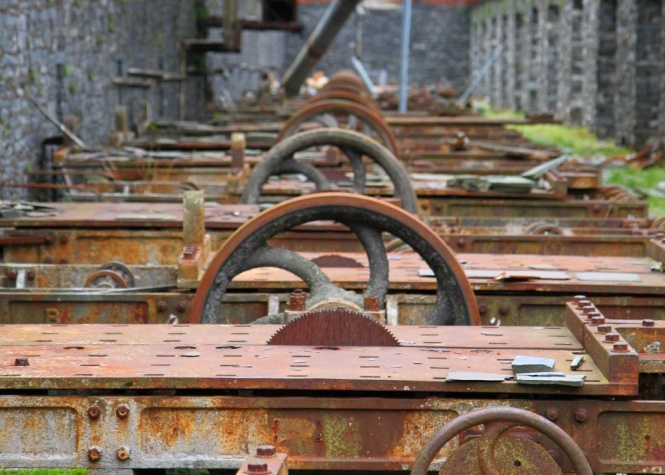 This entry was posted in Gallery, Memory, Places, Post-Industrial Landscape on January 25, 2012 by Paul Scraton. From there it’d basically save the file as aFIT file, and on Garmin Connect you can export it to TCX/CSV.